SPECIALTY VENDING MACHINES Companies! They comapnies may offer varieties of Specialty Vending Machine types: Snack, Soda, Combo, Coffee Food, Frozen, Water, Healthy Vending machines, Coin Air Meters, Micro Markets, Amusement and more! More Vending Business Opportunities, these vending machine companies are listed in alphabetical order by company name. IVM, Inc. began in 1991 as a company dedicated to maximizing their clients’ income and handling their distribution through high level technology. Throughout the years, IVM has grown and succeeded by staying true to that original goal. 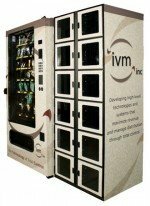 Coin Operated VEND Lockers – IVM now handles all supply vending responsibilities for our customers throughout the United States and internationally.